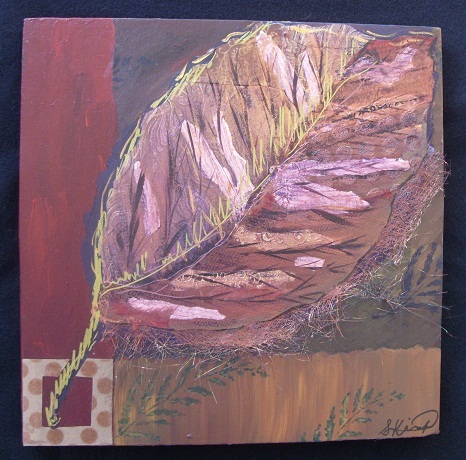 Winter has officially begun but I want to share three completed leaf collages that I began several weeks ago. Starting a new piece is easy for me as I have dozens of ideas for new artwork; however, finishing it isn’t always so easy. I’m getting better about patiently waiting for a piece to guide its own completion, especially in cases where my critical mind has gotten in the way of inspiration. I adore Autumn for a myriad of reasons but what inspired these pieces was a walk that turned into a fairy tale. On this particular day, I took my dogs out for their daily exercise. The day was a bit warm for fall & the sky was turquoise. The contrast of the sky & warm-hued trees got me daydreaming. In this blissful state, I rounded a corner where the leaves literally carpeted the ground in gold, russet, garnet, & rust. It left me breathless & hushed, awed by the colors & hypnotized by the muffled sound of my feet stepping on the still-soft leaves. I began picking up the ones I liked the best, which meant I ended up holding a large bouquet of them! I adored each & every one, unique as snowflakes, seashells, & each of us. 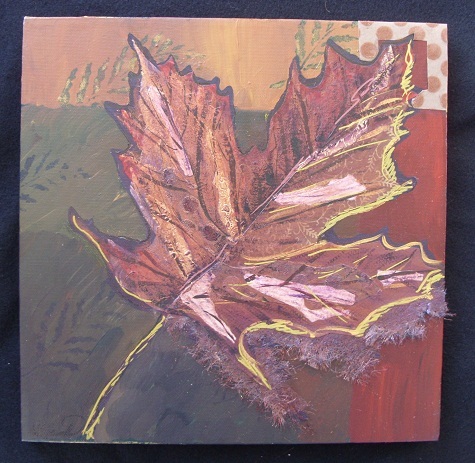 Back in my studio, I selected a few delicate leaves to sketch & eventually collage on canvas. You’ve already seen the works in progress but now they are complete. I chose deep, rich tones of the season to remind myself of that warm Autumn day long after the colors fade & snow becomes my new carpet. I look forward to my imagination being stirred by icicles in the coming months. Each season has it’s own beauty & I cherish them all. 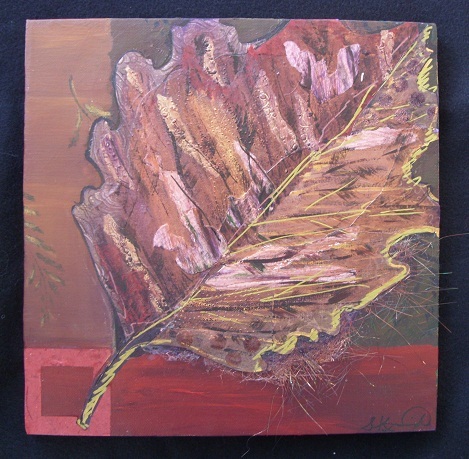 This entry was posted in A Window on Life, Art and Soul, My Love for Nature and tagged art, autumn, collage, fairy tale, inspiration, leaves, nature, patience by puresusan. Bookmark the permalink.